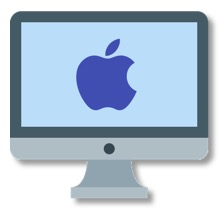 Over the last 25 years , we have developed MacStitch (for Apple Macs) and WinStitch (for Windows machines). Same great app, one for each kind of computer! The app lets you import scanned photos or clip art, chooses suitable colors for you, and converts these into designs, then lets you print out the designs in a variety of easy-to-read pattern styles on your own printer, together with an estimate of the amount of thread used. Alternatively, you can export to a PDF file, if you intend to sell your work on the web. From start to chart in minutes! 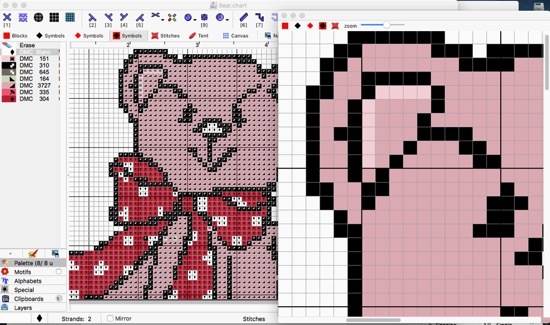 And of course, the more artistic can design their own creations using little more than the mouse. What you see on screen is what you get on paper and cloth. 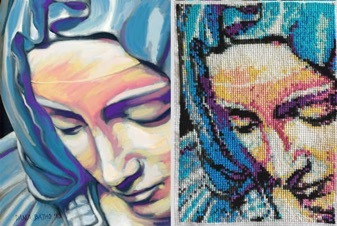 Draw full, half, quarter stitches, beads, knots, backstitch..
Chain stitch, bugle beads, pearlier, diamond painting.. Squares, circles, flood fill, search & replace, multi-level undo. Print the result, export as PNG files or PDF files , and so much more! 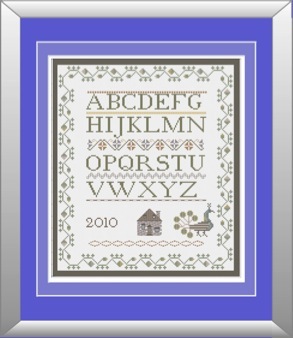 Add single line comments, copyright information, and miniature keys right onto the design. if you have access to charts in .PAT format (PCStitch versions 4 to 7 which can be bought online) , the app can open them directly. 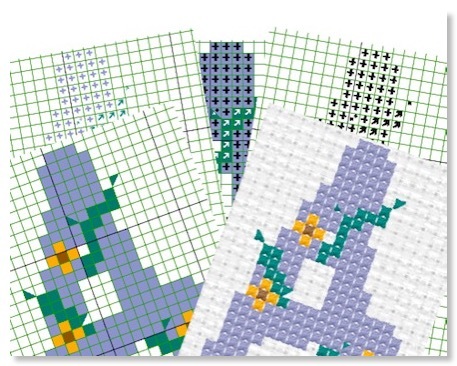 See what the results will be BEFORE you stitch them! 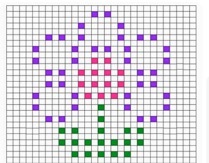 But the new bobble chart option added to Tunisian Crochet dialog turns a ‘normal’ cross stitch pattern, into a text pattern which inserts the extra row, and explains which stitches are plain, and which are bobbled. See the screenshot at the top of the page! 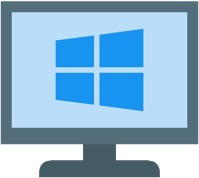 This allows you to edit on the main screen and also see it in a different format in a second window. This option is also exposed as 'Magnify' when you select an area. 'Stock List' in the Palette menu. - Whatever you draw on the left is also repeated in reverse on the right. - drag a line from point to point, and as you drag, the actual length is shown. Like taking a tape measure to the chart. -lists all backstitches, even the tiny hard-to-find ones. Clicking on one displays it on the design. Ticking it in the list marks it for deletion. New 'Knots and Beads Locator'..
-lists all knots and beads, even the tiny hard-to-find ones. Also allows you to recolour these, and nudge them around. 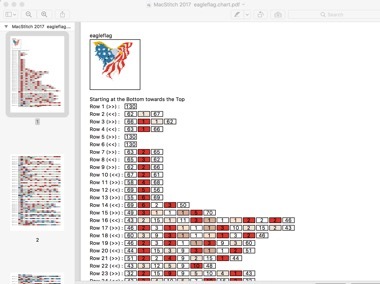 Vector symbols for PDF output.. Note: some PDF viewers do not print these symbols.. if that occurs, open the file in Adobe Acrobat, and when printing select ‘Print as Image’ in the advanced print settings screen. Moved zoom control to bottom right of status bar so that it is available when the toolbar is missing. Extra information items added to Properties window. Added new menu item 'add these colors to MyThreads.threads’ - allows you to add colors from any palette to a threads file which can be used for importing later . Clipboards doesn’t try to delete 'hidden' files. Added an option to save the current threads into a favorites.threads file. This means you can import against a ‘custom’ thread set made up from as many colors as you like. 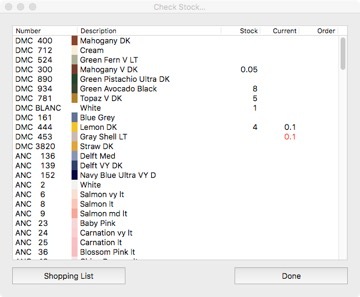 Added a check for duplicated symbols: any which are used twice are flagged in the palette with a yellow alert icon. Now Onion Skin keeps high resolution original image instead of using a lower resolution copy. New Onion Skin Editor allows scaling , up/down/left/right adjustment , plus rotation - with a ‘live view’ to allow you to line up more accurately. A new preference allows you to keep the area selector after rotating and pasting so that you can rotate or flip several times. 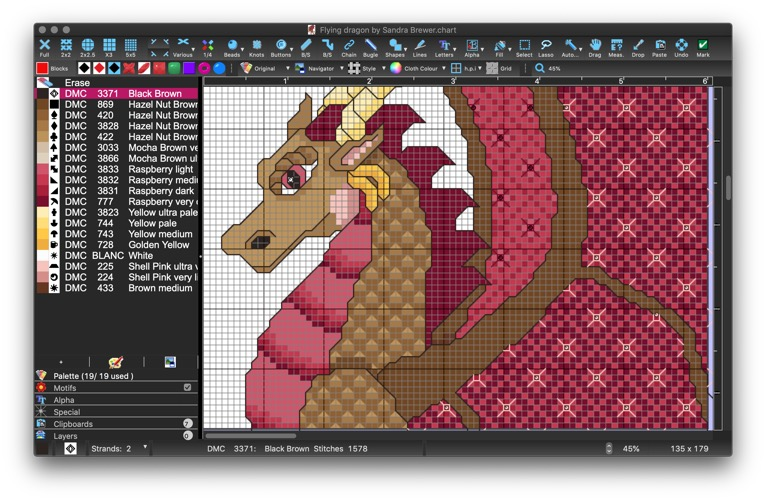 "WinStitch is an amazing and professional piece of software that was designed to help you create stitch charts in a matter of minutes. 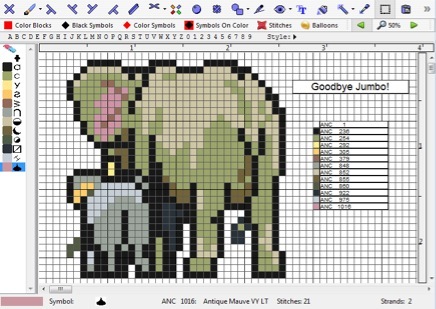 Reliable and easy to use, this powerful application can easily become a 'must have' tool for every tapestry and cross-stitching enthusiast out there." Click Here to watch their video.. Creating all sorts of designs using the built-in templates is quite nice. All the tools you need are right there and understanding how to use them is not very difficult. But the ace up WinStitch’s sleeve is that it lets you import your own images and use them for your designs. Click the icon below to watch their video..